Some of these are pretty old, just ain't posted them. This is my first Select Tie-Dye card and I am impressed. They look real sharp. Not digging the fact they used patches from shooting shirts in this set though. Not a fan of the checkerboard/x-fractor sh*t. Regular refractors are where it's at. I'm pretty sure that patch is from a shooting shirt too. No bueno. This is one of my favorite Bazzy's. It's the only copy I've ever seen. The set is 300 cards deep and these land one per box so she's fairly rare. 1:25 cases ain't bad. She's got a very old school parallel appeal to her. Almost like a 1st Day Issue. Pretty underwhelming 1/1 here. Regular silver foil. She's rare though. I think this is another shooting shirt patch. Pretty neat looking though. The only copy of this card I've seen so far too. I like this card very much, besides the fact that it's two inches thick. Now, my prizm autograph set has 200 players in it. There's 45 rookies, around a dozen of them get minutes and the only real notable player is Yanny. Of the 155 veterans only 25 of them are superstud caliber players. I'm very happy with the set and how difficult the chase has been, but like all Panini sets, I'm still going to need a bunch more players for my autograph collection to be complete. Most notably of these guys is Jordan and Lebron. I got Jordan a while back and recently got this LeBron. This is another UD College set I fell in love with when I saw it. The Jordan in the set is of him slowly dribbling the ball in the backcourt and every copy that I've seen he signed in the wrong place, like the Dr. J that's up right now. I like this LeBron a lot. Great stuff all around. You're right about that Tie Dye select. That may be the best looking thing Panini has ever done. RETIRED FROM THE HOBBY....FOR NOW. 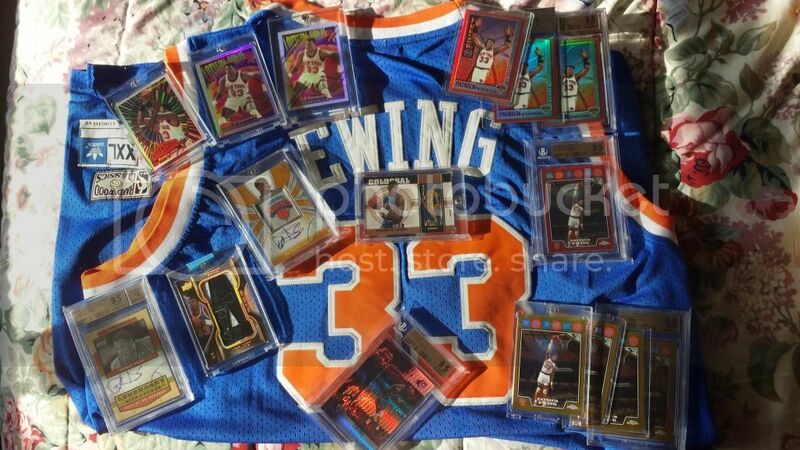 That Malone Prizm is awesome. He was a mountain of a man. And that is the only copy I've seen of the LeBron. I been staring at that picture for a while. cool and shiny cards, thx for sharing! 225 Followers - 1:1 Post/Follower Ratio. Beautiful cards, congrats on all the gorgeous additions! !